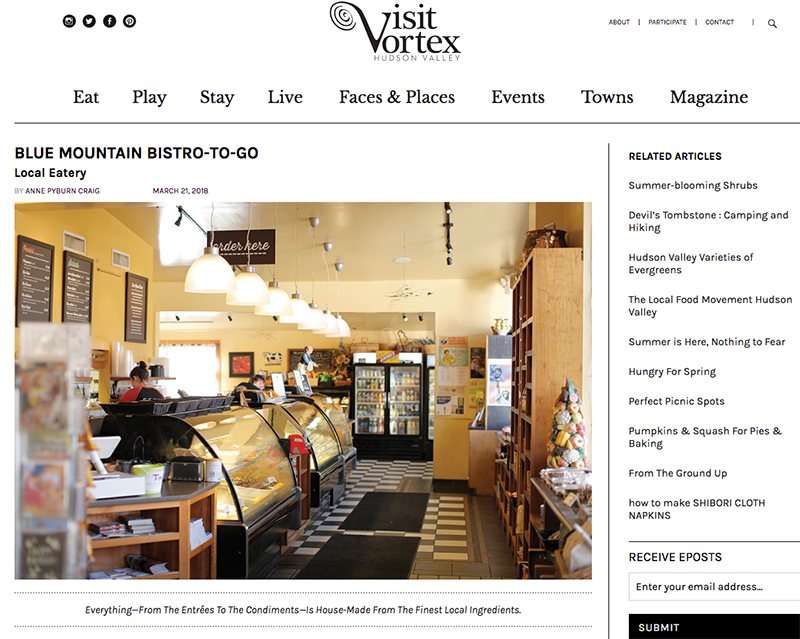 Bistro-To-Go Featured in Visit Vortex! Okay, so you’re hungry but not in the mood to cook, and you’re not in the mood to eat out either. What to do? Gas station munchies? Fast food? Hold it right there. Don’t do that to yourself—not when Blue Mountain Bistro-to-Go has exactly what you need. You’re welcome to stop in and eat at the comfy cafe, where you’ll find local ingredients simmering in a pot of fresh soup every day. But it’s the quality of the takeout fare in particular that makes Bistro-to-Go stand out. Owners Mary Anne and Richard Erickson and their team, known for catering events both large and small, invite you to consider this useful and charming place as “an extension of your own kitchen.” They mean it. But most of our own kitchens can’t match the Bistro’s artistry and variety. Daily lunch specials pair the soup of the day (a seemingly endless variety) with something heartier, like a roasted vegetable moussaka, chicken cacciatore, or a Cuban sandwich. There’s an everyday assortment of sandwiches, wraps, paninis, and salads, guaranteed to enliven the dullest rainy workday or indulge your appetite on a mountaintop or streamside picnic. For dinner, they offer delicious and affordable “plats du jour”, with various gourmet offerings for “Meatless Mondays”, “Fish Fridays”, and other days of the week that can include a variety grass-fed and local produce options. Everything—from the entrées to the condiments—is house-made from the finest local ingredients. There’s even a curried vegan vegetable cake and a lemongrass-infused Thai rice cake for those who eat gluten-free. Blue Mountain Bistro also houses an inspiring food store packed with ingredients you can take hometo use in your own creations: Greek olive oil; vinegars from France, Italy, Spain, and Greece; risotto, polenta, and couscous; gourmet and sea salts; jams and jellies; local and imported artisanal cheeses; olives and local pickles; Spanish chorizo, prosciutto, soppressata.... The friendly staff are always glad to offer tips and suggestions, and will strive to provide you with just about anything you desire. And don’t neglect the bakery, where you’ll find cupcakes, cakes, pies, muffins, tiramisu, mousse, and much more, along with a full line of gluten-free but flavor-filled options. Blue Mountain Bistro has earned a reputation as one of the area’s finest caterers, offering a level of attentive personal service and on-point presentation that can send a special day into the stratosphere. “Wherever there’s love you’ll find us,” they say, and wherever you find their food, you’ll find folks falling in love with it as they savor each tasty bite, impeccably and joyously prepared. Healthy, gourmet, affordable, and located right on Route 28 in Kingston—their convenient location makes the “what to eat for dinner?” decision a no-brainer. Stop in for some Bistro-to-Go...you’ll see what we mean.